Don Lincoln is a senior scientist at the U.S. Department of Energy's Fermilab, the country's leading particle physics research institution. He also writes about science for the public, including his recent "The Large Hadron Collider: The Extraordinary Story of the Higgs Boson and Other Stuff That Will Blow Your Mind" (Johns Hopkins University Press, 2014). You can follow him on Facebook. Lincoln contributed this article to Live Science's Expert Voices: Op-Ed & Insights. Scientific discoveries come in many forms, like the surprise of radioactivity or the long search for the predicted Higgs boson. But some discoveries are mixed, with a hint in the data pointing to future measurements that can take years. A scientific study of the third kind is getting underway now, and the payoff for physics could be huge. The magnetic moment, essentially a measurement of the strength of the magnet created by each muon, has been both measured and calculated to a precision of one part in 1012. That's like measuring the distance between the Earth and sun with a precision of a millimeter. Currently, the prediction and measurement do not agree, and this discrepancy might be the first hints of physics beyond the Standard Model, which is our current theory describing the subatomic world. That would be a big deal, because physicists like me would be elated to punch a hole in the reigning theory. If such a hole is found, it will lead to a new and improved scientific model that does a better job than the existing one. Given that the existing theory is quite successful, this will be a real advance in knowledge. When placed in a magnetic field, these little muons will precess, or wobble in a certain way. In a magnetic field, we can detect something called the precession frequency of the wobbling. This measure involves the charge of the particle and the g factor, which is used to distinguish between specific cases: In classical theory, g = 1, and in ordinary (e.g. non-relativistic) quantum theory, g = 2. Just after World War II, measurements of g for electrons showed a small discrepancy from the theoretical "2" value, with the experimental result being 2.00232. This discrepancy arises from effects described by the theory of quantum electrodynamics, or QED. In order to focus on the discrepancy (0.00232), researchers subtracted off the "2," which is where the name for the experiment arises (g-2). In quantum electrodynamics, we investigate, among other things, the existence of virtual particles, or what is sometimes called the quantum foam. Virtual particles are a bath of matter and antimatter particles that flicker into existence for a tiny fraction of a second and then disappear as if they never existed. They occur everywhere in space, but are especially important when they appear close to subatomic particles. The difference between measurement and prediction, divided by the combined uncertainty (what scientists call the sigma) is 3.5. In particle physics, a sigma of 3.0 is considered evidence, but a true discovery requires a significance of 5.0. The Fermilab g-2 collaboration has commenced operations. They will first commission the apparatus and then record data in earnest. Data taking will continue through early July. So, what might the outcome be? If everything operates as expected, and if the value for g measured at Fermilab is the same as that from Brookhaven, the data recorded this spring at Fermilab could have a 5-sigma significance when combined with the data recorded at Brookhaven. That would mean a discovery. On the other hand, the result measured at Fermilab could differ from the Brookhaven measurement. The new measurement might agree with calculation, in which case the discrepancy would go away. But what if g-2 makes a discovery? What would be the likely outcome? As I mentioned before, the anomalous magnetic moment of the muon is very sensitive to the existence of nearby virtual particles. These virtual particles slightly change the muon's magnetic moment. Further, the ultraprecise agreement between measurement and calculation would not be possible if virtual particles didn't exist. However, and perhaps obviously, the calculation used only known subatomic virtual particles. One possible explanation for the observed discrepancy is that additional, currently unknown subatomic particles exist in the quantum foam. It is worth noting that, for decades, discoveries of subatomic particles were the province of highly energetic particle accelerators. Einstein's famous equation E = mc2 describes how energy and mass are the same. So, to discover heavy particles, you just needed a lot of energy to make them. Currently, the Large Hadron Collider at CERN is the world's most powerful accelerator. 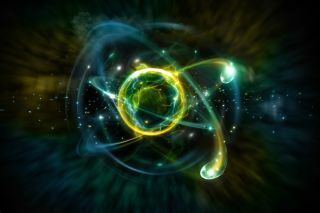 However, the brute-force method of making particles isn't the only way to explore the high-energy realm. Heisenberg's uncertainty principle says that events that are energetically "impossible" can occur — if they occur for a short enough time. So, it is possible that virtual particles that do not ordinarily exist could flicker into existence just long enough to affect the muon's magnetic moment. If so, then a very precise measurement would reveal their existence. This is perhaps a situation where a scalpel works better than a sledgehammer, and perhaps the Fermilab-based g-2 experiment could beat the CERN LHC to the punch. But first, a note of caution: The history of science is replete with examples of 3-sigma discrepancies that disappeared when confronted with additional data. So, nobody should bet on the outcome of this measurement. The discrepancy could simply be a statistical fluke. However, there is no question that the Brookhaven g-2 measurement could be the first indication of a paradigm-changing discovery. The data recorded this spring will be analyzed over the fall and could be reported in less than a year. While caution is clearly warranted, the first run of the g-2 experiment should be watched with keen anticipation.